Can 'upscaling 4K' still cut it in the era of true Ultra HD? Selling for a fraction of the price of Ultra HD Blu-ray players, this polished deck slashes support for that new format and instead offers to upscale your 'old' Blu-rays to 4K quality. Souped-up Bluetooth wireless music streaming worked well, but it doesn't play nice with iOS devices. It's sleek, it's small and it's most definitely smart, but Sony's latest Blu-ray player begs a big question: Why hasn't Sony made a machine that plays Ultra HD Blu-ray discs? Given its movie studio arm's propensity to push 4K movies, that's something of a surprise, but the Sony BDP-S6700 isn't without a trick of its own – it's cheap. It might be one of the last reasonably premium Blu-ray players that doesn't support Ultra HD Blu-ray discs. And since high-end UHD Blu-ray Players come with a huge premium for the privilege (we're looking at you, Samsung UBD-K8500 and Panasonic DMP-UB900), its price might be its best defense. 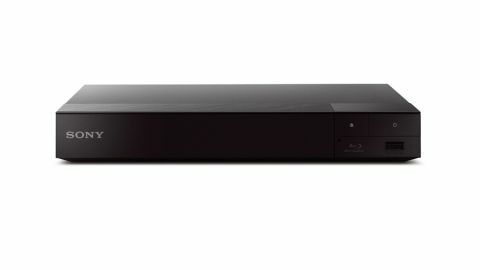 After all, the Sony BDP-S6700 goes for just US$130/UK£150/AU$229. What the Sony BDP-S6700 does promise from its diminutive 255x39x192 mm, 900g package is 4K upscaling (for those with an Ultra HD 4K TV), Full HD 3D support (time to crank-up that Gravity 3D Blu-ray disc) and wireless music features galore. In contrast to the UHP-H1, the BDP-S6700 has a pretty basic build quality. Seriously, it looks great – all sleek black and shiny (and tiny) – but it lacks the solidity you might expect from a 4K-capable machine. Worrying about whether it would survive a drop is hardly relevant for a machine that's destined to remain stationary, of course, but when discs are going in, out and shaking all about, it all sounds a tad jerky. The opposite is the case with the BDP-S6700's software; it boasts a pleasingly smooth-looking, easy-to-navigate and fast-working user interface. Studded with apps for Netflix and Amazon Video, the UK version I reviewed also included the likes of Spotify, YouTube, BBC iPlayer, BBC Sport, Dailymotion, Sony Channel, MeteoNews, Green.TV, Demand 5, Wuaki, PlayStation Now (the BDP-S6700 also accepts a DualShock Bluetooth controller) and PlayStation Video, among others. The dual core processor and remote, complete with Netflix button, makes fast work of navigating, and loading apps. Meanwhile, the rear of the BDP-S6700 features a HDMI output, a coaxial digital output, and a wired Ethernet LAN slot, though there's also a WiFi module on-board (which even offers dual-band 2.4GHz and 5GHz connections). On the front you'll find a single USB slot for playing video, music and photo files from a thumb-drive. Although top-of-the-tree in Sony's Blu-ray arsenal goes to the unusual 'Hi-Res certified' UHP-H1, which also offers 4K upscaling, the BDP-S6700 sits well above the Full HD-only BDP-S3700 and BDP-S1700. Given the popularity of wireless music streaming and Bluetooth speakers in living rooms, perhaps the most interesting feature of the BDP-S6700 is its Bluetooth-powered music streaming. Popular, yet derided for its for often atrocious music quality, Bluetooth has here been beefed-up by Sony using its own LDAC streaming codec. It's essentially Bluetooth, but three times faster, so three times more data is carried. It's also technically possible to create a simple multi-room music system using the S6700 and Sony's SongPal Link app, though you need a bevy of Sony soundbars for that. For video, the standout feature is 4K upscaling, though just as important is the BDP-S6700's IP Content Noise Reduction PRO, an algorithm designed to smooth the jagged edges that are so obvious when low-quality video from the internet is watching on the big screen. The BDP-S6700 chucks out sparkling images from Blu-ray discs. Judging the quality of 4K upscaling is never easy since Ultra HD TVs themselves have similar circuitry, but there's no denying the quality is almost indistinguishable from 'real' 4K. Colours from Gravity on Blu-ray were rich and bold, and the detail impressively high. It also auto-detects 24p footage, which adds more smoothness. A third slice of good news is the BDP-S6700's 3D compatibility, which may already be considered a 'legacy' feature, but will be welcome for owners of 3D discs. Hooked-up to a 3D-ready Full HD plasma (most 4K TVs just don't support 3D), the BDP-S6700 delivered clean and depth-consistent 3D images. Way more importantly than 4K upscaling or 3D, however, is the BDP-S6700's IP Content Noise Reduction PRO, which does noticeably improve the look of low-quality footage; a blast of some ropey-looking videos from YouTube were easily watchable on the big 55-inch screen, and looked better than when the same footage was watched on the TV itself. Dive into the settings and for IP Content NR Pro you can choose strong/medium/mild for video or film. That said, when I turned my attentions to the BDP-S6700's wireless audio features (via the huge Bluetooth button on the remote), disappointment set in. Try as I did, I could not get an iPhone to link to the BDP-S6700 over Bluetooth, with the SongPal app offering little help. However, I did successfully pair some Plantronics Bluetooth headphones as a passive device, and then an Android smartphone for streaming music. The latter did, at last, prove the worth of the LDAC-boosted Bluetooth, but even the unmistakably expanded mid-range can't make up for the fact that what you hear depends on your TV's speakers. Unless the BDP-S6700 is attached to a home cinema system, LDAC is of limited use.